My story began almost 19 yrs. ago at St. Paul’s Hospital in Dallas TX. My transplant journey was a long and hard journey. I went in the hospital April 29 and left on August 19th. My family was told on Mother’s Day in 1997 that I was not going to survive to receive a heart transplant. My first decision was not to have a heart transplant because, I didn’t want to put my family through it. Plus I couldn’t accept that someone would have to die for me to live. My decision was made for me when I saw my first two grandchildren born six weeks apart. Their births made me see clearly if I had the transplant, I would be able to see them grow if even for a short time. I now have six grandchildren. Four of these grandchildren are in college, one is in High School, and one is in Middle School. I am thankful for my special donor family as they made that sacrifice under such a tragic accident. Thank you seems so small, but one of my biggest thrills is seeing the look on my donor’s Mom’s face listening to her daughters’ heart for the first time with a stethoscope each time we are together. 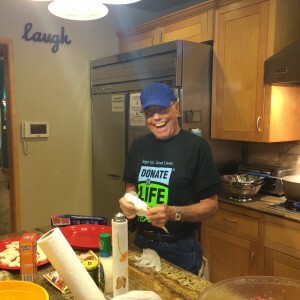 Her smiles encourage me and makes it all worthwhile each time I volunteer whether it is speaking to organizations, speaking to nursing students, cooking at the Ronald McDonald’s house, or registering people to become registered donors. I was humbled to be the Volunteer of the Year for Fort Worth Life Gift this year for accumulating the most hours of volunteering. My first experience at the Transplant Games of America was in Houston 2014. The winning of medals was secondary to the honor I felt just to be able to participate in the Games. I competed in one of my favorite hobbies, the golfing events and being a native Texas, I felt compelled to compete in the Texas Hold’em Poker event. It was overwhelming to see all the many others there to compete. On the other hand, it made an impression on me that others were there because of being a donor family and how many lives had been saved. The fact that I can still compete after 19 years and be a person of “HOPE for others and honor my beautiful donor and her family is truly a miracle. 04 de May de 2017 a las 11:38 11Thu, 04 May 2017 11:38:07 +000007. I love your story. I am a retired RN who worked in an IICU In Florida, we had many opportunities to work with the donar patient. I know well the family who donated, My daughter is married into that family and was in Texas the night of the tragic accident. They are a beautiful family. 08 de May de 2017 a las 13:04 01Mon, 08 May 2017 13:04:16 +000016.